The toilet valve is the part that controls the refilling of the tank every time you flush the toilet. A defective fill valve will not do its job properly and you will find that the water keeps on running which is going to put a burden in your utility bill. Buying the best toilet valve is going to ensure that your toilet works properly. It is normal for a toilet valve to get worn after years of continuous use and this is when you should make a decision to buy a new one. If your fill valve leaks or if your toilet keeps on running all the time, then you shouldn’t wait any longer. The cost of replacing your toilet valve is nothing compared to the money you pay for water that you are not even using. Shopping for a new toilet valve is not easy especially with all the different brands and models. You want to make sure that you are buying a high-quality product that will last for a long time. This is why we worked hard to prepare this guide to help you pick the next replacement for your toilet. 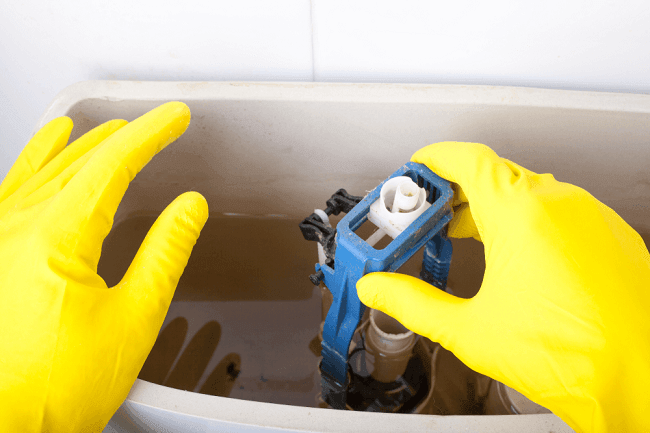 Read on to learn more about 7 of the best-selling models on the market, in addition to tips on how to pick the right fill valve for your toilet. Are you looking for little help while shopping for the best toilet valve replacement kit? Read the next section to learn more about some outstanding products that are available on the market. The first product on our list is an industry favorite. 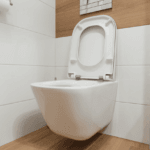 It is affordable, durable and suits almost all toilet models. It comes with a complete valve and flapper repair kit that fixes the problems of a runny toilet that doesn’t fill properly. This amazing toilet valve is going to reduce noise in your bathroom so that your toilet with fill and flush quietly. The refill rate of this amazing piece is almost 2 times faster than other valves on the market. This is great news, especially if you need to flush your toilet often. It is extremely durable and is going to last for up to 10 years with no problems whatsoever. The installation process is so easy. It takes less than 10 minutes to adjust its height and install it to your toilet, and then it will be good to go. 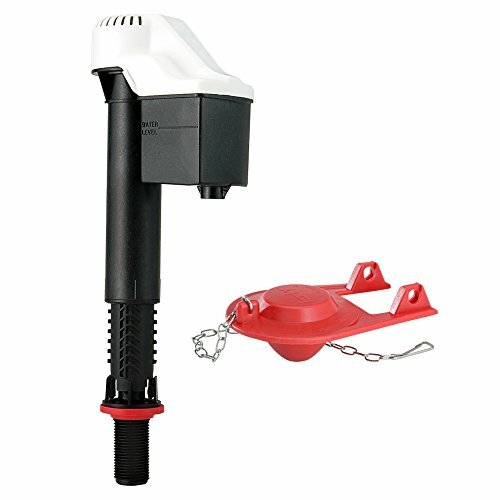 This fill valve is more suitable for older toilets that use 3.5 gallons of water per flush. If you have a new efficient model that uses 1.6 or 1.28 gallons per flush then you might want to look for another option. Affordable and durable toilet valve. Universal model that suits most toilets. Fast refill if you need to flush your toilet often. Eliminates noise while refilling and flushing. This good toilet valve is the best part to install to a Toto toilet. This valve features the EcoPower which generates its own Hydropower to run at different levels of flow. It also features the Hydroprotect that reduces the pollution. 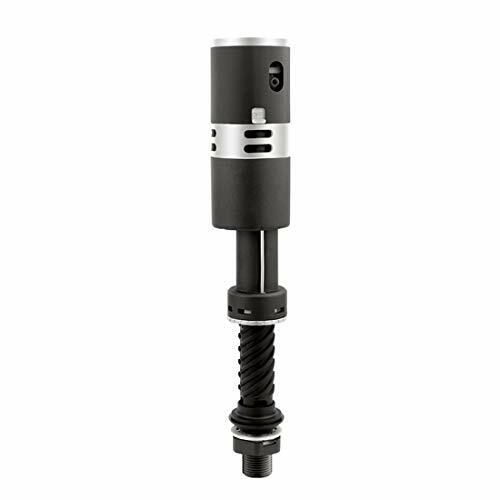 This piece is adjustable to fit a 2-piece toilet and the height can be adjusted for different flow rates. The installation process is easy and doesn’t take much time. This medium-priced toilet valve is going to help you save money by fixing the problem of your runny toilet. It is durable and prevents leaks. The high-quality plastic parts are not going to break with regular use. It works perfectly even with low water flow. You shouldn’t buy this fill valve unless you have a Toto toilet. It can be installed to other brands but the performance will not be as impressive. Features EcoPower to work at different levels of water flow. Hydroprotect feature to reduce pollution. This is probably the best universal toilet repair kit because it suits almost every model on the market. It will fix the problem of slow filling, runny, and noisy toilets so you can install it to your master or guests’ bathroom. No tools are required to install this repair kit and it will immediately improve the way your toilet functions. The best thing about this toilet valve is that it can suit older models that use 3.5 gallons per flush. It can also be adjusted to suit new and high-efficiency models that use 1.6 and 1.28 gallons per flush. The red rubber valve resists bacteria keeping your toilet running smoothly for a very long time. It is also designed to resist city water treatments so it doesn’t wear with exposure to chlorine. It can even work properly with well water and hard water. Whether you have a one-piece or a 2-piece model, old or new toilet, you shouldn’t think twice before installing this repair kit. It is also budget-friendly. Suits one-piece and 2-piece models. Can be adjusted for 3.5, 1.6, and 1.28 gallons per flush. Highly resistant rubber that doesn’t react with bacteria, chlorine, well water or hard water. If you have a Kohler toilet, then you definitely need to buy this kit. 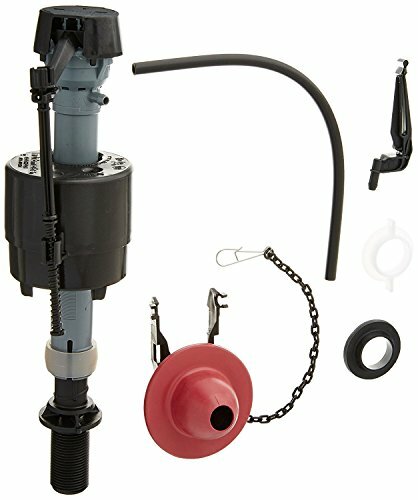 This is the best replacement kit for a Class 5 toilet from Kohler. It comes with various inserts that help you adjust it to optimize performance and save water. By adjusting the fill-rate, you will be able to save money on your utility bill in the long run. This fill valve is specially designed by Kohler engineers to enhance the performance of their first-class toilets. It is quite affordable and will immediately solve the problem of a runny or slow filling toilet. It is made of high-quality plastic parts and doesn’t have any metal parts that might be subject to corrosion. It doesn’t come with easy-to-understand instructions, though. However, if you are planning to replace it on your own, then the best way is to check how your old valve is installed and just do the same. High-quality plastic parts that don’t wear easily. Comes with different parts so you can adjust it for various heights. 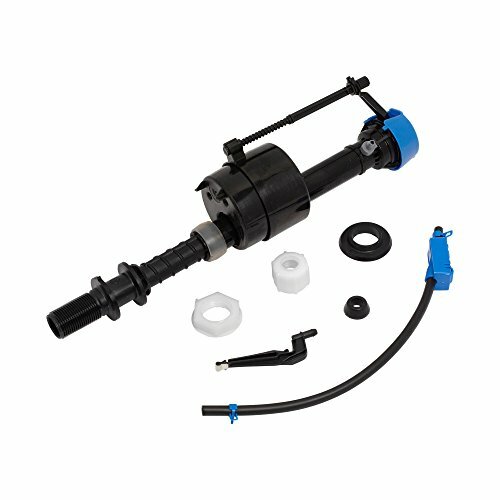 This fill valve is a little bit pricier than other models, but it is well worth the price. It is the quietest toilet fill valve if you have an American Standard toilet. It is easier to install than a lot of other models on the market and will immediately improve the way your toilet functions. Once you install this valve, you will see that your toilet tank is filling quietly and quickly. It is made of high-quality parts that don’t wear with regular use. You can easily install it and even tighten it with your fingers to make sure that there are no leaks. If you have an American Standard toilet then you need to buy this part because it can be easily adjusted to fit several models. It doesn’t empty the tank completely but keeps just a little water to help save your water consumption. This also boosts the refill rate so your toilet will fill faster. Don’t worry if you have no prior knowledge of plumbing. You can easily install it in less than 10 minutes. The perfect pick for American Standard toilets. Fills the tank quietly and quickly. Saves on the water consumption. This is the best solution for runny noisy toilets. It can be easily adjusted to suit different models. 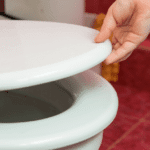 It is very easy to install and doesn’t take much time to enhance the performance of your toilet. This compact toilet valve can be adjusted up or down to suit different models. You can adjust the height of the tube to suit the level of water. 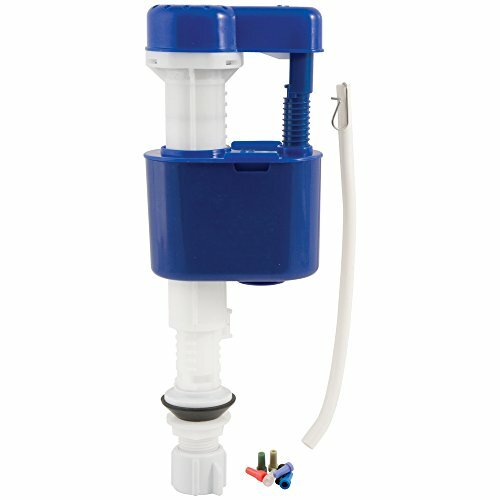 It is a lot quieter than other fill valves and definitely easier to install. 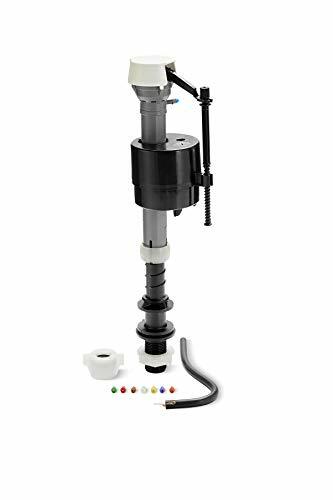 All the parts are integrated into a slim tube, so if your toilet tank is particularly small then you can definitely install this one. It takes 15 seconds to fill the tank completely and you will be able to flush your toilet with no problems whatsoever. It comes with easy instructions. Can be easily adjusted to suit different toilets. Can work with different toilet models. Fills the tank quickly and quietly. 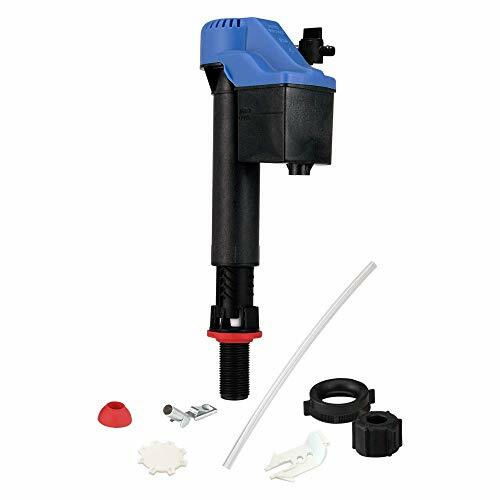 The last product on our list is the most reliable toilet fill valve if you want to save on your water consumption. By installing this affordable toilet valve, you will save as much 38% water with every toilet flush. It comes with quick water shut-off that prevents the water from continuously running. It will reduce noise and the consumption of water in the long run. This adjustable toilet valve can work with different 2-pieces models. This guarantees that your toilet will get just the right amount of water needed to flush it properly so you won’t have to worry about the excessive use of water. It comes with an anti-siphon technology that keeps the drinking water safe. 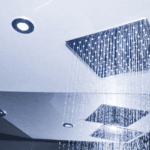 It can be installed fast and will immediately reduce the noise and unnecessary water consumption. Affordable toilet valve that reduces water consumption by 38% per flush. Adjustable to suit different toilet models. Water shut-off to prevent continuous running. Anti-siphon technology to keep the drinking water clean. If your toilet valve is made of durable parts, you will guarantee that it is going to last for long. Most high-quality products are made using excellent-quality plastic and rubber parts. These are treated to resist bacteria and will prevent the growth of mold in your toilet tank. They should also be sturdy enough to resist chlorine and other city water treatments. It is a good idea to avoid a toilet valve that contains metal parts unless they are properly treated to resist corrosion. It is very important to make sure that your toilet valve is adjustable unless you are buying the exact same model that your toilet came with. An adjustable toilet valve will help you save on your water consumption because the valve will stop the water flow once it reaches the right height. Some models are specially designed for low water flow so they will fill your tank properly. A good toilet valve will fill your tank fast without causing much noise. It is quite embarrassing when your toilet makes a loud noise when you are flushing it and while it refills. You can always install a good toilet valve to eliminate this noise and keep your toilet working efficiently. Some models also come with a water shut-off valve. This will prevent the unnecessary filling of the tank while reducing the money you spend on the water bill. This is an important feature to consider. You can definitely hire someone to install your new toilet valve but this represents extra costs that you want to avoid. Some models are very easy to install and come with clear instructions. They will be able to improve the way your toilet functions in a few minutes. 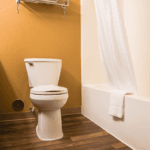 Knowing how to pick the best toilet valve will help you take the right decision. 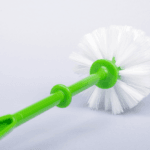 You want to make sure that you are buying a high-quality product that will last for long and will always keep your toilet functioning properly. Considering the price while shopping for a new valve repair kit is important but it is not the most relevant factor. We guarantee that after reading our article, you will be able to pick the right product to install to your toilet.